I was used to suffering through burpees during CrossFit classes, but one day I showed up and the WOD (workout of the day) was 100 burpees for time. I thought my coach was joking. I mean, I've definitely done over 100 burpees in a workout before, but that was broken up by other exercises. Thirty was probably the most I had done at one time, so 100?! WTH. And I pay for this?! But I did it. And I didn't die! It took me over 10 minutes and by the end I collapsed to the floor, heart racing, panting, and muscles burning, but so proud. I thought that if I did this 10-minute workout every day, it'd be a quick way to get in a little extra much-needed cardio, build my endurance, get stronger, and burn some bonus calories. So I committed to 100 burpees a day for two weeks. My rule was that they had to be 100 consecutive burpees, so even if I did burpees in my CrossFit class that morning, they didn't count toward the 100. 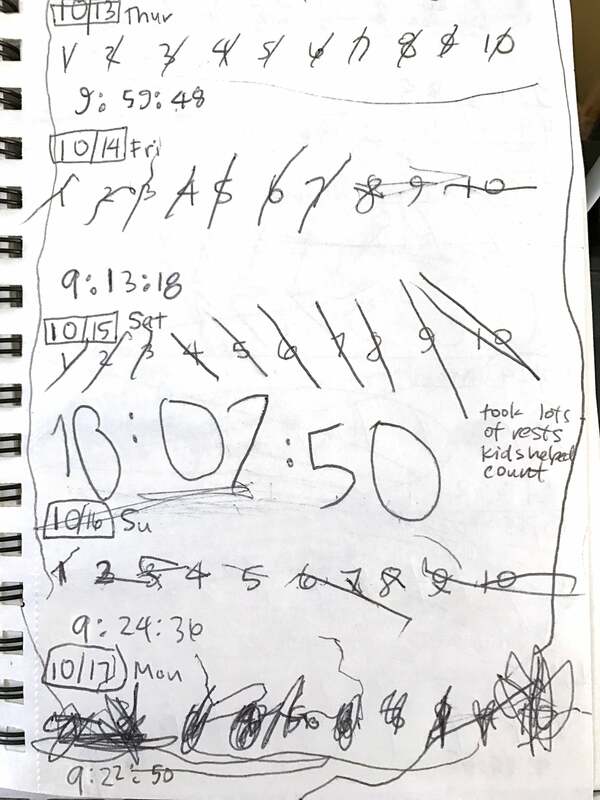 I wrote down the numbers one through 10 in my fitness journal, started the timer, and every time I did 10 burpees, I'd cross off a number. It made counting them easier and also gave me a little break in-between. I even got my kids help me count! Burpees got easier: Those first few days were a struggle. I was taking a lot of breaks and getting so exhausted that I had to step my feet forward instead of jumping. But by the second week, my arms and core got stronger and my movements became more fluid. And when we did variations of burpees in class, like box jump burpees or bar-facing burpees (where you jump over a barbell), those felt easier, too. I got faster: I realized that if I did 10 burpees per minute, I'd finish in about 10 minutes, so that pushed me to do 11 or 12 per minute (at least for the first 50). My initial time of just over 10 minutes turned into 9:30, and one time I was able to do it in 9:13! So practicing burpees actually works. It was mostly mental: By the 40th burpee, I was feeling so winded and fatigued (and questioning why the hell I decided to subject myself to this torture! ), and my brain kept saying, "Just stop!" I learned to shut out those thoughts, to ignore how uncomfortable my body was feeling, and to focus on counting and get through it. I felt awesome the rest of the day: After getting home from my 5:45 a.m. CrossFit class, before hopping in the shower, I did those 100 burpees. Every single day I reached 100 felt like such a huge accomplishment; I felt so proud and happy, and it really set the tone for my day. I started to hate burpees: By the end of that second week, I was so glad this little experiment of mine was almost over. I was one of those weird people who didn't mind doing burpees, but after 14 days of forcing myself to do so many, I would cringe when I saw them in a WOD. This is when I knew it was time to stop. Overall, this little challenge was definitely worth it for all the benefits, but I think maybe next time I'd just choose 50 burpees instead. That seems way more doable and like something I could keep up with for more than two weeks. But if I ever can't get in some exercise while on vacation or just because of life, I know I could always take 10 minutes to do 100 burpees and get in an awesome, quick workout! If doing this many burpees at one time seems completely insane, here's a four-week workout plan to build up to 100 burpees. I was used to suffering through burpees during CrossFit classes, but one day I showed up and the WOD (workout of the day) was 100 burpees for time. I thought my coach was joking. I mean, I’ve definitely done over 100 burpees in a workout before, but that was broken up by other exercises. Thirty was probably the most I had done at one time, so 100?! WTH. And I pay for this?! But I did it. And I didn’t die! It took me over 10 minutes and by the end I collapsed to the floor, heart racing, panting, and muscles burning, but so proud. I thought that if I did this 10-minute workout every day, it’d be a quick way to get in a little extra much-needed cardio, build my endurance, get stronger, and burn some bonus calories. So I committed to 100 burpees a day for two weeks. My rule was that they had to be 100 consecutive burpees, so even if I did burpees in my CrossFit class that morning, they didn’t count toward the 100. I wrote down the numbers one through 10 in my fitness journal, started the timer, and every time I did 10 burpees, I’d cross off a number. It made counting them easier and also gave me a little break in-between. I even got my kids help me count! I got faster: I realized that if I did 10 burpees per minute, I’d finish in about 10 minutes, so that pushed me to do 11 or 12 per minute (at least for the first 50). My initial time of just over 10 minutes turned into 9:30, and one time I was able to do it in 9:13! So practicing burpees actually works. It was mostly mental: By the 40th burpee, I was feeling so winded and fatigued (and questioning why the hell I decided to subject myself to this torture! ), and my brain kept saying, “Just stop!” I learned to shut out those thoughts, to ignore how uncomfortable my body was feeling, and to focus on counting and get through it. I started to hate burpees: By the end of that second week, I was so glad this little experiment of mine was almost over. I was one of those weird people who didn’t mind doing burpees, but after 14 days of forcing myself to do so many, I would cringe when I saw them in a WOD. This is when I knew it was time to stop. Overall, this little challenge was definitely worth it for all the benefits, but I think maybe next time I’d just choose 50 burpees instead. That seems way more doable and like something I could keep up with for more than two weeks. But if I ever can’t get in some exercise while on vacation or just because of life, I know I could always take 10 minutes to do 100 burpees and get in an awesome, quick workout! If doing this many burpees at one time seems completely insane, here’s a four-week workout plan to build up to 100 burpees.